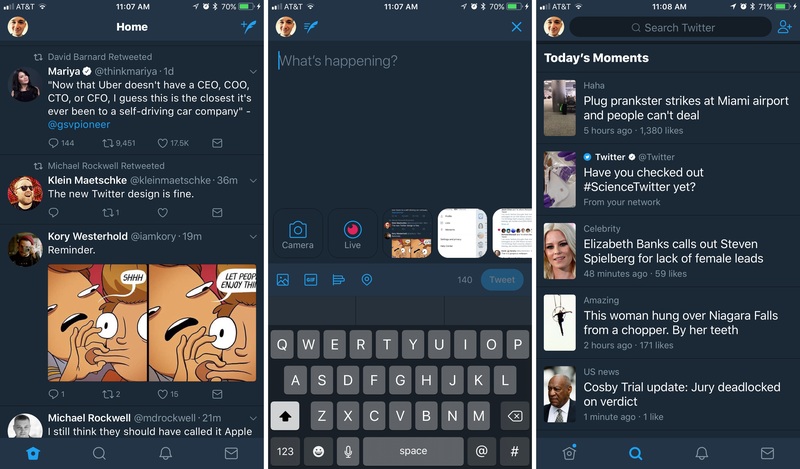 Announced in a blog post earlier today, Twitter has a major update to its iOS app and other platforms rolling out to all users starting today. The new design is inspired by Twitter’s Android client – and while that detail scared me at first, using the updated iOS app for a few minutes allayed all my fears. This is a clean, beautiful redesign that brings few drastic alterations, and instead focuses on lots of nice polishing touches. The most significant change to the iOS app is the existence of a new sidebar menu that pops out from the left side of the screen. This menu provides a quick way to switch between different accounts, and also lists your Following and Follower counts, navigation buttons to access your Profile, Lists, created Moments, and Settings, as well as a handy toggle to switch Night Mode on and off. Everything in the sidebar is clear and well organized, with plenty of breathing room; my initial impression of this new menu is entirely positive. Outside of the sidebar menu, the rest of the app feels very familiar, but with a variety of small tweaks that improve the overall experience. The reply icon has changed to a speech bubble, purportedly to create less confusion for new users. With your Profile now available from the sidebar, that leaves only four main navigation tabs: Home, Search, Notifications, and Messages. They all have fresh new icons that look great. Safari View Controller is now the default viewer for opening links. For a long while Twitter had been testing Safari View Controller with some groups of users, but making it universal is a welcome, long-overdue change. Reply, Retweet, and Like counts will update in real-time as you use the app. A variety of visual improvements, such as updated typography that includes the use of bold headers for different sections, rounded avatars, and more. There’s more to explore, but that covers the bulk of changes. Overall, I am a big fan of this redesign. The changes add up to a freshly improved, yet still familiar Twitter app, and my fear that it would too strongly resemble an Android app were unfounded. It may closely resemble Twitter for Android, but this still feels very much like an app that belongs on iOS. 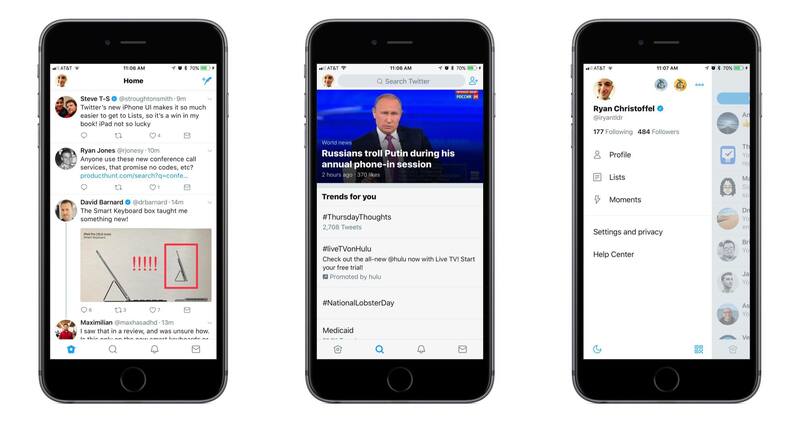 Twitter says the changes are rolling out over the next several days, so it’s possible you may not see them yet. Twitter for iOS is available on the App Store.